To test the predictions of Economic theory mentioned above, two measures are needed: one measuring the level of government’s cultural support; the other measuring the size of the cultural sector. 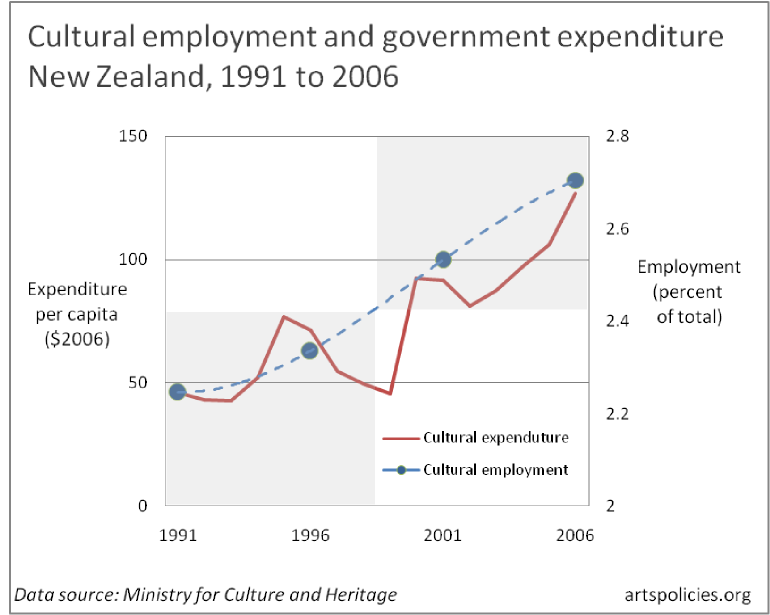 real (ie inflation-adjusted) national government cultural expenditure per capita. employment in cultural occupations as a percent of total employment. The figures to the right show timelines for these two indicators for each country from 1991 to 2006. Different y-axis scales allow the two data series to be plotted on the same graph. The timelines show clearly that both funding and employment increased in both countries over the period. An alternative way to display the data, which reveals the relationship even more clearly, is shown in the figures at the bottom of the page. These figures plot the two indicators against each other to give an idea of how strong the relationship is between them: the closer the data points are to the line, the stronger the relationship. It is unusual in the social sciences to see data series like these so strongly correlated. How might the data be interpreted? 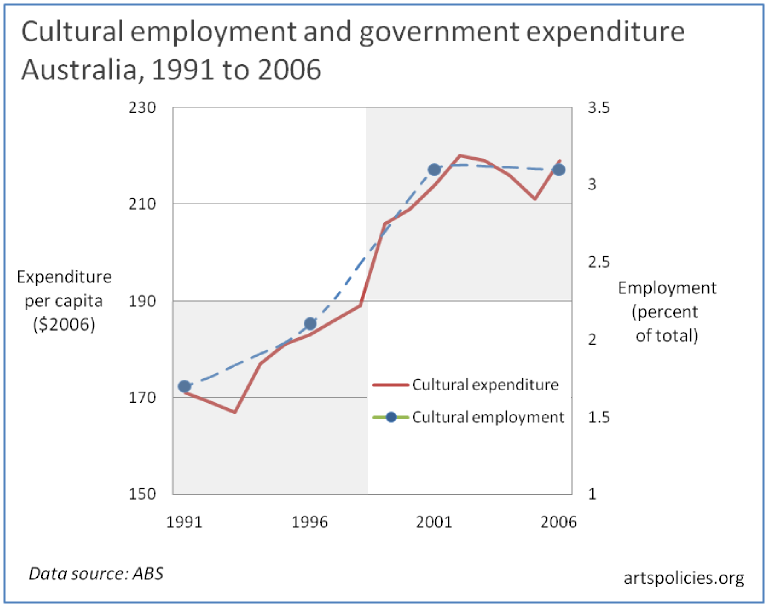 With the data showing such a strong relationship between government cultural expenditure and the size of the cultural sector, it would be easy to jump to the conclusion that the size of the cultural sector has been driven by the increase in funding. 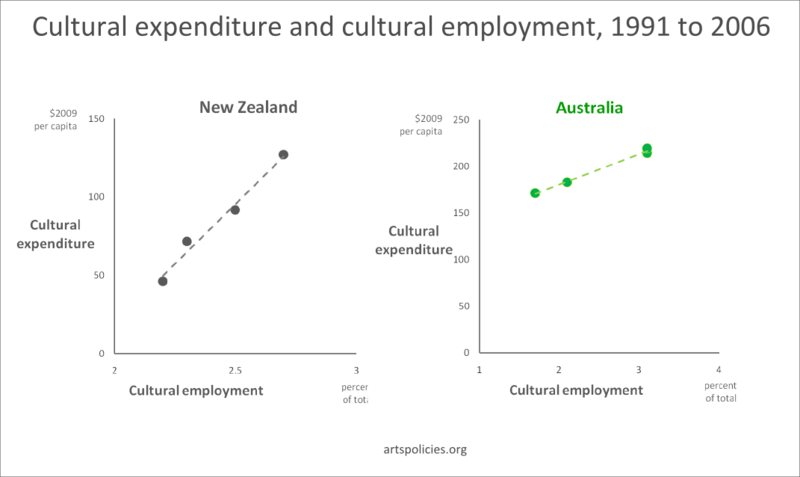 However, it is important to remember that the data show a correlation, not a causation; they can’t say that an increase in funding caused the expansion in employment in each country’s cultural sector. Nor do they tell us that the expansion has brought a qualitative improvement – an improvement in culture or cultural experiences. That said, the data do provide some evidence to support the prediction from Economic theory that increased government cultural expenditure will cause an expansion in the cultural sector. 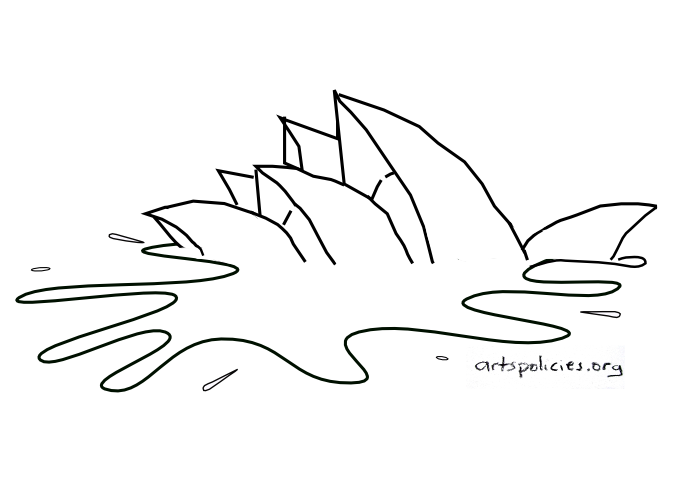 And they do hint that Australasian cultural policies have, at the very least, ‘gained traction’ – that the cultural policies of governments in Australia and New Zealand have not been impotent. Cultural policies have, it appears, enjoyed a degree of success. This entry was posted in Cultural policy, Economics of the arts and tagged Arts policies, Arts policy, Cultural policies, Cultural policy, Cultural statistics, Economics, Linkedin by Christopher Madden. Bookmark the permalink.